Cortec Eco Film bags are 100% biodegradable and compostable. These 33 gallon liner bags measure 18" x 15" x 44". They are designed to replace nondegradable as well as starch and polyethylene-based films. Unlike standard starch-based technology, Eco Film is heat and water stable and does not disintegrate or break apart while in use. Once discarded in soil or compost, Eco Film bags will decompose 100% into carbon dioxide and water within weeks. 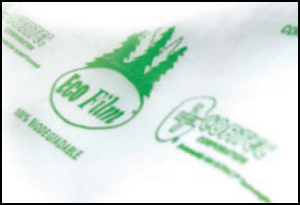 Eco Film will not devalue or contaminate compost, unlike polyethylene blends. 75 bags per case.